It’s taken awhile, but I’ve finally become comfortable with having another “Chip” in the world of real estate, and honestly, I like him a lot. He’s funny, skilled and charismatic. He’s a family man and a doting husband. He’s humble and he clearly cares about his clients. All the things I aim to be. He’s managed to amass an audience of 4.3 million viewers of his real estate reality HGTV show, Fixer Upper. He’s Chip Gaines, and I’m a fan. As easy as Chip and his wife, Joanna, make home renovations appear, the real reality is that even the smallest renovations can be daunting. But, I guess that’s the point. These guys are experts, and they make it look relatively easy, because they know what they are doing. They are a professional agent, remodeler, designer, and decorator all wrapped into one dynamic, compelling and attractive package that somehow manages to transform the worst looking house on the street into one of the very best looking re-do’s you could imagine. It makes for great TV watching…and, heck, who doesn’t love the idea of seeing a project from beginning to end in just 30 minutes? If you’ve ever tackled a renovation project (be it a do-it-yourself job or a hired-out job) take a moment to pat yourself on the back, because you deserve it! Now, please keep your hand up if it went completely smoothly and without surprises. Keep your hand up if it came in under budget. And go ahead and give yourself a standing ovation if you’re 100 percent thrilled with the outcome. My wife Carrie and I caught the renovation bug early, and we found ourselves buying and fixing-up older and older properties (1977, 1972, 1969) to make into our homes throughout our 25 years on Hilton Head Island. We gave each one of them our very best effort to bring their appearance and functionality, always focusing on charm, curb-appeal, and the sometimes-elusive “bang for the buck” factor. We watch Chip and Joanna with great enthusiasm, admiring their taste, creativity and skills. Joanna often goes “junking” down there in Waco, Texas, and she’s somehow mastered the ability to find the perfect old items to integrate into the otherwise new feel and finishes of the renovated house. Meanwhile, Chip’s off in the background juggling hammers, and otherwise fixing, moving, and changing the “sticks and bricks” of the house to improve its flow and function, all under Joanna’s thoughtful directive. “Real life” home renovations sort of require all of that: a careful and creative direction, a willingness to improvise, a team approach, and often a sense of humor. In the end, just like the reactions we all get to see by the excited owners in the last minutes of each episode when they do “the reveal,” the outcome can be one of the most rewarding and emotionally-compelling aspects of homeownership. There’s pride of authorship in home renovation, taking something that was one way, then tweaking and improving it into something much better. And if the project comes in on time, and on budget, that’s the icing on the cake. • Hire proven professionals. Interview builders, architects, and designers, because these are the people that will shape the process for you. You’ll want to find the ones with the right credentials, of course, but also the same outlook, energy and taste as yours. • Get several estimates, and be realistic. Renovations can be pricey, and I have yet to see local construction prices match the seemingly unrealistically low estimates they achieve down in Waco, Texas. • Check references. Contact previous customers of the professionals you are considering, and ask how the process went. Find out what challenges came up and how they were overcome. • Have a housing plan. 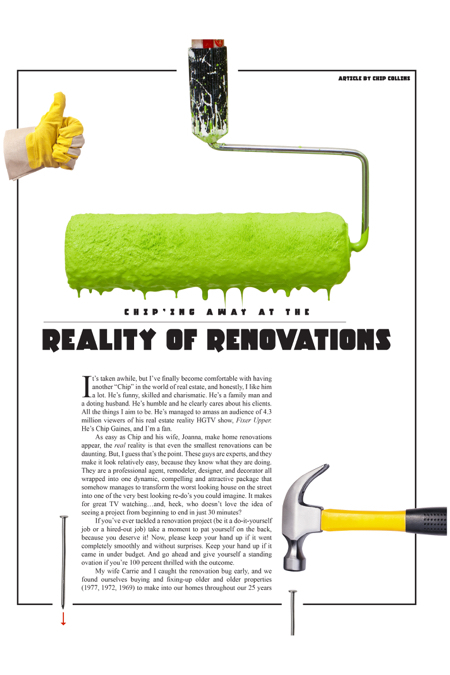 Have you ever lived through (and in) a major renovation project? We’ve done that a couple times, and it’s not for the faint of heart. Come up with a plan that works well for you, your family, as well as your contractor so you can confidently and comfortably get to the finish line. • Check the job. Renovations, by their nature, turn up the unexpected, and decisions must be made to work through them. Be present and available with your contractor to help make those decisions as they come up so that there is minimal down-time and so that you get what you want. Remember, someone must make the decisions in order to move forward, and it’s usually better that you are involved upfront to reduce the chance of something needing to be undone/redone the way you really want it. • Communicate. Set regular meetings on-site with your contractor, express your concerns, sing out praise for a job well done. Do your best to be involved with open communications from beginning to end. • Celebrate. Life is short, and renovations are meant to be fun, exciting and rewarding. Make “the reveal” at the end of the project something that you are thrilled with, because after investing the time, energy and resources, you deserve it! Chip Collins is the owner/broker of Collins Group Realty, a boutique real estate firm celebrating 15 years in business selling real estate in Hilton Head and Bluffton. He is an Ohio native who grew up vacationing on the island and made the move permanently in 1992. Along with his wife, Carrie, and their two daughters, Collins lives in Sea Pines and enjoys boating, home improvement projects and quality time with his girls. He is an amateur triathlete and has participated in regional Ironman events and the Boston Marathon.